As someone who has enjoyed previous King King albums and seen them do great live performances on a number of occasions I was looking forward to listening to their new album. I was expecting it to be good but I was wrong – this isn’t just a good album, it’s a fantastic album. The album kicks off with (She don’t) Gimme no lovin’. It’s a fantastic song and really reminds me of Thunder – it’s got a lot of commercial appeal. It’s no wonder it was released as the first single. That’s just the start of things. From there the album continues with every track living up to the standard set by the opener. “Broken” is another track I particularly like. Throughout the album, the vocals are great, the guitar playing is fantastic, and the keyboards are used to add that wonderful richness that only a Hammond organ can give. It’s a fantastic album – the musicianship and songwriting can’t be faulted. 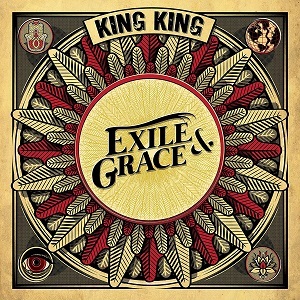 This is the best album yet from King King. They were a great band before but with this album they’ve taken a leap forward and are bound to gain a whole load of new fans.